Sailed while a dolphin swam along side the Hobie Getaway in the Tres Palmas Marine Reserve. Excellent breeze in Rincon, Puerto Rico! See The Reef, Sail The Coast, Live the Adventure! Check out this link for the video. Learn to Sail a Hobie Getaway in Rincon, Puerto Rico. Youth Summer Sailing starts mid May! Want information? 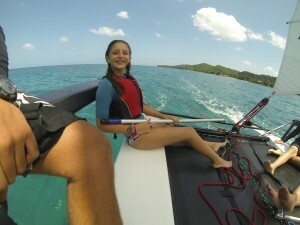 Send us a text, call 787-421-4700 or visit www.rinconsailing.com for details! Come to sailing MONDAY April 21, 2014! 10-1. You must let us know if you are attending! Celebrate Natalicio de José de Diego with us! **5 Sessions Available – 9am – 1pm. Let us know if you are attending! Thank you!